Today (6 June 2015) His Holiness the 14th Dalai Lama celebrates his 80th birthday. And celebrations are happening around the world, not only in Buddhist communities but from people who admire him and have learnt many things from his approach to religion, world peace, kindness, compassion, mindfulness – and just his overall view of the world and our collective rights and responsibilities as human beings. His far reaching popularity is unprecedented by any religious leader. Not many non-Catholics would flock to a stadium to see the Pope and few would line up to see the Archbishop of Canterbury or any of the major leaders of Islam or Judaism or other religions. Yet the Dalai Lama seems to speak to many people in the world. 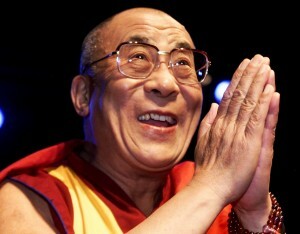 In fact a poll conducted in Europe in 2013 found that the Dalai Lama’s popularity was on par with Barak Obama, at 78%. There is no doubt that the Dalai Lama is a charismatic public figure and for those who have seen him in person it is simply impossible not to laugh out loud with him (even if we don’t know what he’s saying because he’s speaking in Tibetan) and to admire his openness and the simplicity of his words. But I also believe that the Dalai Lama speaks to something deeper that many of us are craving in our lives. In a world dominated by materialism, individualism and political power games, the Dalai Lama provides a simple alternative to how we see the world and our place in it. Although I have had a long history of involvement with Buddhism, when I think of my learnings from the Dalai Lama my mind goes back to the book he wrote with Howard Cutler, ‘The Art of Happiness’. In this book Howard Cutler interviews the Dalai Lama about the relevance of Buddhist teachings for the Western world. The message is simple – find out what makes you happy and do more of that; and correspondingly, find out what makes you unhappy and do less of that. Sounds simple? Well have a go, right now, at making a list of those things that make you happy. Most people find this very hard. And of course as the Dalai Lama rightly points out, there is a huge difference between happiness and pleasure. We are not talking about retail therapy or having a few drinks or watching reality TV. Happiness is a much deeper emotion. The Dalai Lama suggests that happiness is a state of mind and not as related to external conditions as we might like to think. The deep sense of peacefulness that comes from happiness radiates out to others around us, commonly in the form of compassion. As we make peace with our own lives and become less judgemental and more compassionate to ourselves, it follows that we are more able to do this for others. So as we celebrate with the Dalai Lama today, take a few minutes to think about your happiness, that deep place inside where you feel peaceful and joyful, and what you might need to do or to change to cultivate this feeling more in your life.